A skier weighing 0.80 kN comes down a frictionless ski run that is circular (R=30 m) at the bottom, as shown .If her speed is 12 m/s at point A, what is her speed at the bottom of the hill (point B)? 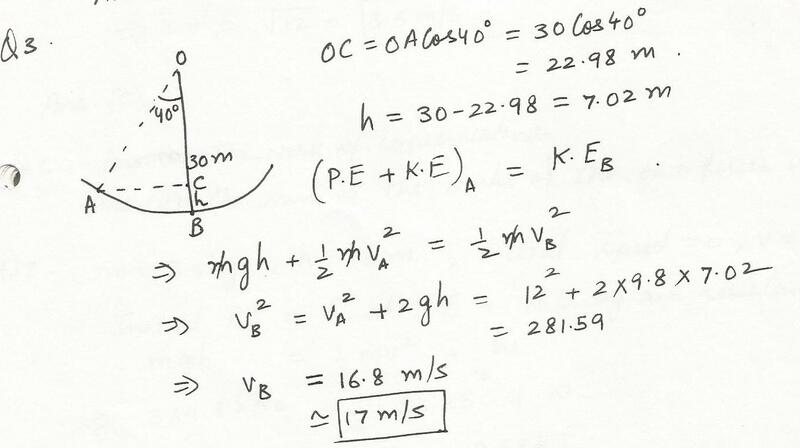 A 2.0-kg mass is projected from the edge of the top of a 20-m tall building with a velocity of 24 m/s at some unknown angle above the horizontal. 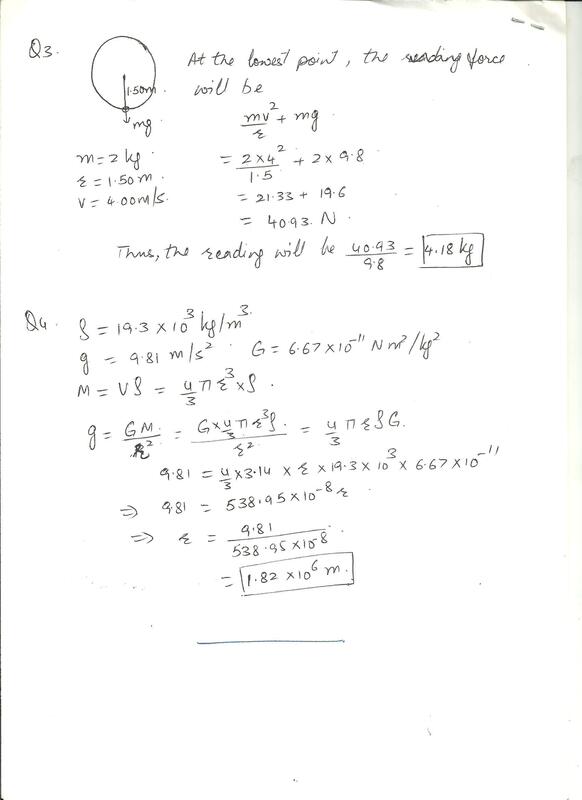 Disregard air resistance and assume the ground is level.What is the kinetic energy of the mass just before it strikes the ground? A single conservattive force Fx =(6.0x-12) N (x is m) acts on a particle moving along the x axis. 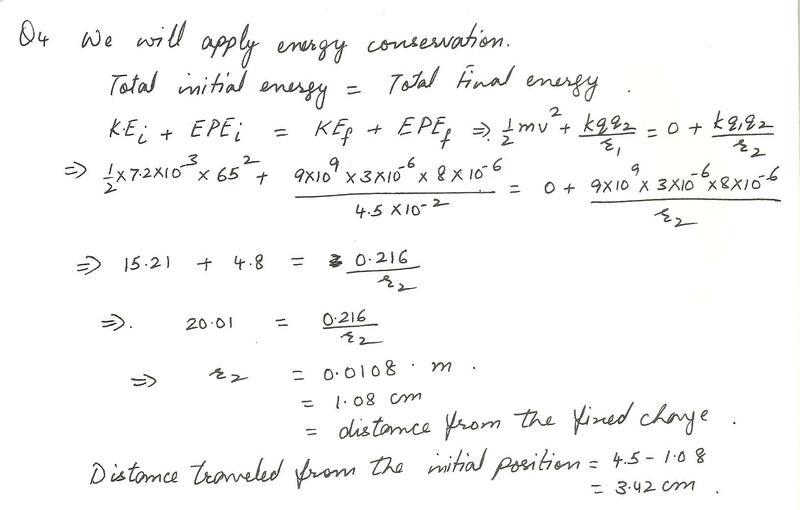 The potential energy associated with this force is assinged value of +20 J at x=0 What is the potential energy at x=3.0m? When one gram of gasoline burns in a car,s engine, the amount of energy given off is approximately 1.03x10^4 kcal. Express this quantity in BTU. What is I (Btu. hr-1 .in. F, ft-2) in Proper units (W.m-1. C-1)? The express elevator in the Sears Tower in Chicago averages a speed of 9.1 m/s in its climb to the 103 rd floor, 410 meters above the ground. 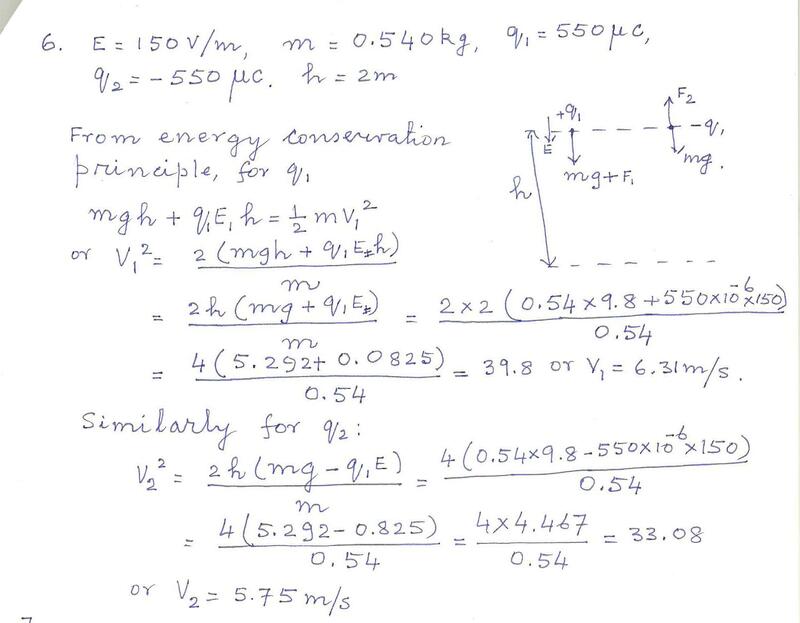 Assuming a load of 1.0 x10^3 kg, what average power must the lifting motor supply? 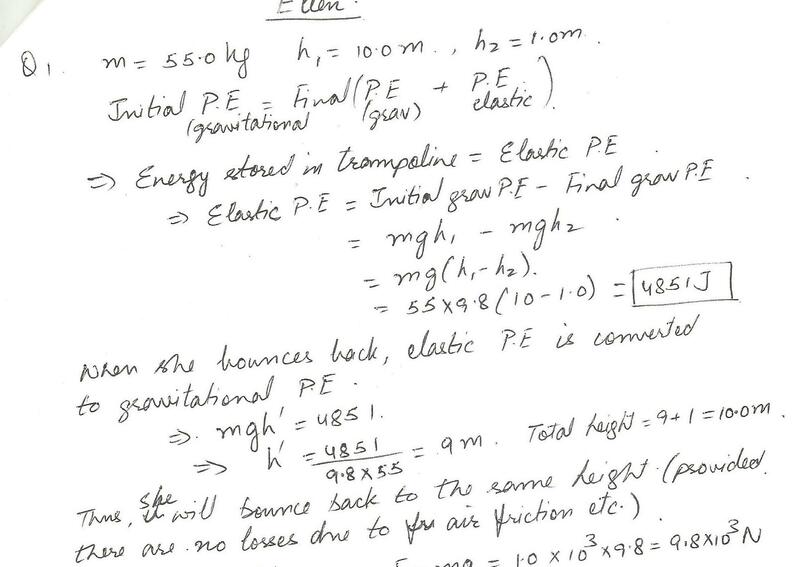 An athlete whose mass is 55.0 kg steps off a 10.0 meter platform and drops onto a trampoline which, while stretching, brings her to a stop 1.00 meter above the ground. Assuming no losses, how much energy must have momentarily been stored in the trampoline as she came to rest?How high should she bounce on the rebound? A 200g mass attached to the end of a spring causes it to stretch 5 cm. If another 200g mass is added to the spring, the potential energy of the spring will be:the same, 3 time as much, twice as much,4 times as much. Two men, Joel and Jerry, push against an immovable wall. Jerry stops after 10 min, while Joel is able to push for 5 min longer. Compare the work they do. Who does the most work or do they work at all. A marathon runner has an average metabolism rate of about 9.5 E2 kcal/h during a race. 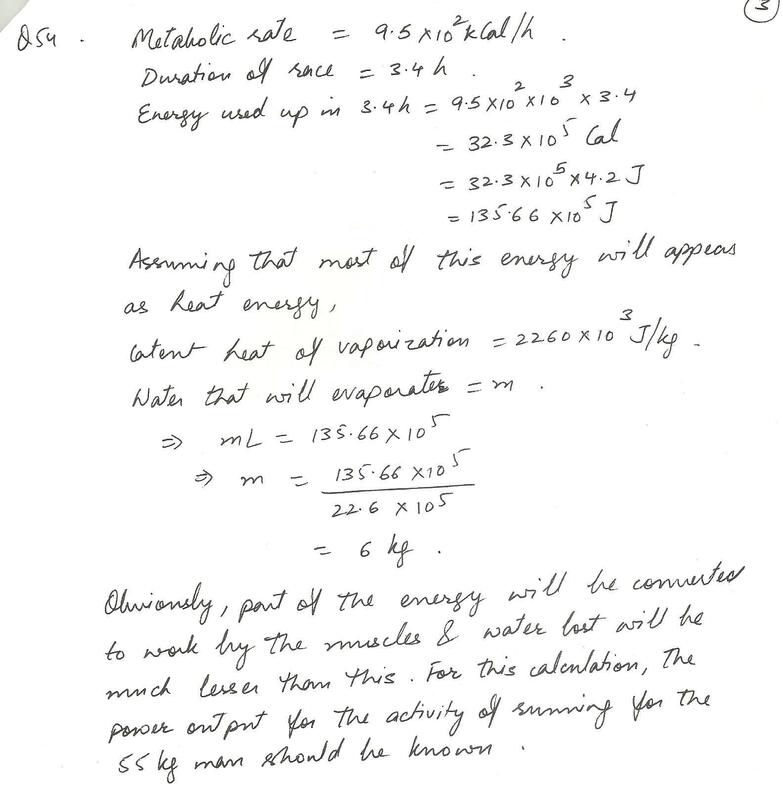 If the runner has a mass of 55 kg, estimate how much water she would lose to evaporation from the skin for a race that lasts 3.4 h.
A charge of -3.0 uC is fixed in place. From a distance of 4.5 cm, a particle of mass 7.2 g and charge-8.0 uC is fired with an initial speed of 65 m/s directly toward the fixed charge. How far does the particle travel before its speed is zero? A steam turbine producing 15 kW of mechanical power is operating at 35% thermodynamic efficiency. 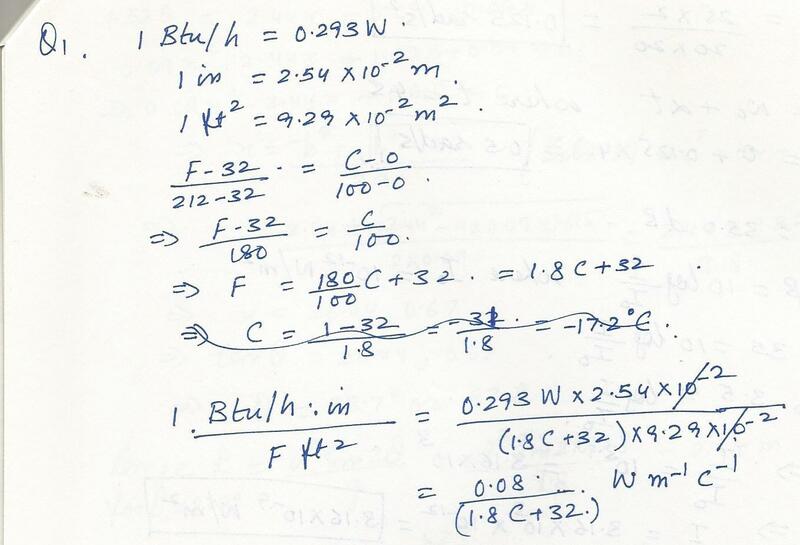 Determine the heat input per hour to the steam turbine. Displaying 46-60 of 599 results.